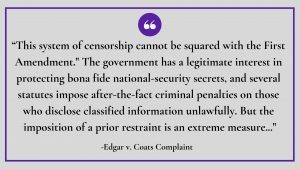 Prepublication Review: An “Unconstitutional Censorship” of Former Intelligence Officials? 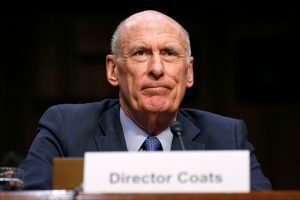 Five former intelligence officials are suing two U.S. intelligence agencies and the Department of Defense, challenging the constitutionality of the agencies’ “prepublication review” system. The prepublication review system requires current and former intelligence agency employees and military personnel to submit for government approval anything they write about their past work. According to the New York Times, while previous lawsuits have been filed in regards to specific manuscripts, this is the first lawsuit that challenges the entire review system as a whole. The complaint outlines how the prepublication review system has grown since it was created informally in the 1950s through the Office of Security and Office of General Counsel. At the time, only a few former CIA employees sought to publish manuscripts. The review system expanded to cover more individuals and agencies in the 1970s when more people began to write critically about the agencies and their activities. 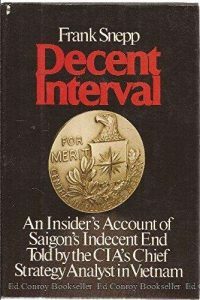 In 1976, in the wake of a Fourth Circuit ruling allowing the CIA to enforce a prepublication review agreement against former employee Victor Marchetti, then-CIA Director George H.W. 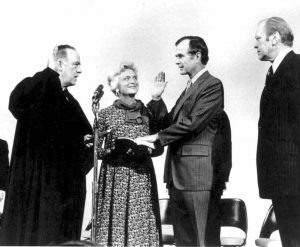 Bush established the Publications Review Board to review the non-official publications of current employees. Four years later, the Supreme Court ruled in Snepp v. United States that the CIA’s employment agreement that contained prepublication review requirements did not violate free expression rights. The decision allowed the CIA to seize the proceeds earned by Frank Snepp, a former officer who had published a book without submitting it for review. In the intervening years, intelligence agencies expanded prepublication reviews as a lifetime requirement for former employees as well as current ones. The review process has also expanded to include a broader swath of individuals, including those without access to classified information. At the same time, the review requirements and obligations have become more complex. The amount of material submitted for review has dramatically increased as well, leading to lengthier review times. According to a draft report of the CIA Inspector General obtained by the ACLU and the Knight Institute, the CIA received 43 submissions in 1977, but in 2015, it received 8,400 submissions. 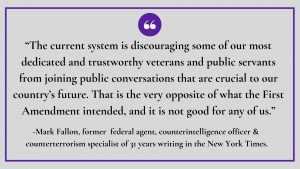 Mark Fallon, a former federal agent, counterintelligence officers and counter terrorism specialist of 31 years and one of the plaintiffs in the suit, wrote an op-ed in the New York Times about the government’s unwarranted and capricious censorship of unclassified material. Fallon wrote a book criticizing the George W. Bush’s administration’s policies around the interrogation tactics used on foreign suspects, and says he was careful to avoid using classified material, instead citing only material from congressional hearings and official investigations that was already public. He submitted his manuscript to the Department of Defense (DOD) for review, a process that was supposed to be completed within 30 working days. Instead, it took the DOD 233 days to return the manuscript and it contained numerous redactions of already published material. According to the Knight Institute, at least 17 federal government agencies have some form of prepublication review in the form of regulations, policies, and non-disclosure agreements.